I felt sluggish and defeated about half way through a 5K race Saturday when a woman I’d never met ran up beside me with encouragement and vulnerability. “Every step is for a life,” she said, alluding to the local charity that organized the run to raise money and awareness. The goal of Life House Care Center goal is to save a child’s life and share the gospel with their parents by providing pregnancy testing and counseling, community referrals, and other information and support. “Yes, both my kids are adopted so this cause is close to my heart,” I tell her as our steps become in sync for this stretch in the middle of 3.1 miles. She shook my hand and told me her name. I told her my name. Then I told her our pasts don’t define us. God makes us new. We both knew this, but it never hurts to remember what matters. And then she ran ahead. 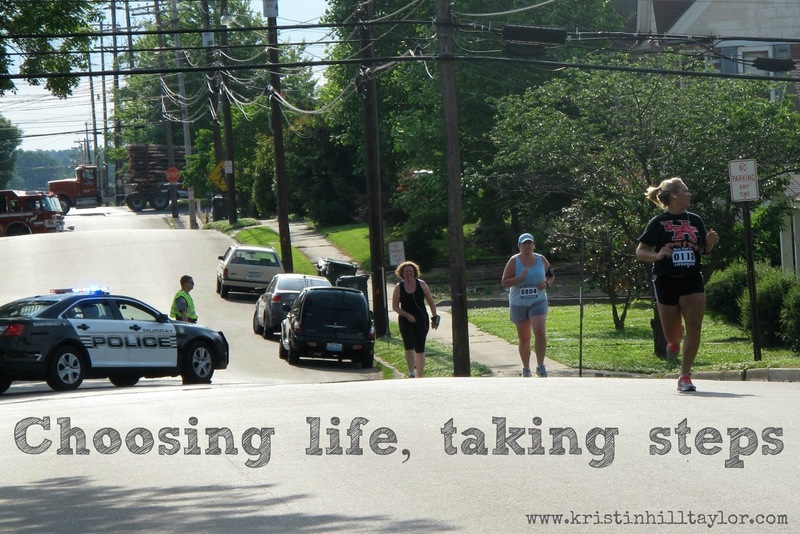 But those moments in my fourth-ever 5K changed me. Instead of feeling defeated, I thought about our story. I thought about how two women chose life for babies they wanted us to call daughter and son. I thought about a woman we know of who recently delivered twin babies and then had to return to jail while her tiny son and daughter remained in the NICU. I thought about how God redeems the hard seasons. Instead of dwelling on how my calves wanted to give out on me, I thought about my dear friend who is walking through a dark season with some relatives and how it’s been weighing on my heart for her. I thought about my other close friend who has lived in a hard season in her home. I thought about how another friend confided in me something I never knew about her as I trusted her with part of my story. Everybody goes through hard times in life – and we’re better when we make ourselves vulnerable because it helps us heal and reminds others they aren’t alone. Messages of truth were coming through my headphones: “Lay ‘Em Down” by Needtobreathe. “All Things Possible” by Mark Schultz. “Remind Me Who I Am” by Jason Gray. “Gold” by Britt Nicole. “Home” by Phillip Phillips. I splashed water from the drink station on my face, never stopping my stride. The water mixed with my tears. I was physically exhausted but spiritually refreshed. I kept running – and praying and praising God for the details in this life, both in my own story and in others’. On the second to last turn in the 5K race, my left foot turned as I rounded the turn eager to head up the small hill toward the finish line. I thought I was going to fall down, but managed to keep my balance. My ankle ached immediately, but I kept going because I was almost there. I made it and it didn’t even matter it was my slowest 5K race time yet. And such is taking steps in life. Sometimes the journey is hard, especially when we don’t feel prepared for what comes our way and end up hurting. But choosing life is a choice we make over and over again. Thankfully, we don’t have to run this race alone. I’m sharing this post with Beth Stiff’s Three Word Wednesday, Holley Gerth’s Coffee for Your Heart, and Jennifer Dukes Lee’s #TellHisStory. Doesn't God amaze you sometimes! What an inspiring lesson. I love to see what you write about each event in your life. You are truly an inspiration to me and I need to tell you that more often. So glad we are taking these steps together. Thank you, Peggy. My life certainly wouldn't be the same without you – so thankful to do life together. This post just encouraged my heart so much. Thank you for the precious reminder of Hebrews 12. I love it… and i love you friend! Good for you! I had the opportunity to hear Bianca Olthoff speak last weekend at my church's women's conference. And one of things she said that spoke to me the loudest was, "Run yo race!" She really said "yo" bc she was poking fun at the fact she is from the 'hood in LA, lol. But "Run your race and stop looking to the right and left to what everyone else is doing," are words that I have taken with me and think on nearly daily. Congrats on running and finishing your race! Wonderful encouraging post. So true…we choose life every day, several times a day. We choose to keep going or not. So proud of you that you keep running the race on so many levels!! So grateful we don't have to run the race alone! Great encouragement today, Kristin! Yes, so thankful for those God brings alongside us to encourage us. Thanks, Holly. I'm glad to see you here today. Love that she came alongside you at that moment. Shows we all need to listen to those promptings!